The valproic acid test measures the total valproate blood level. What is a valproic acid test? This valproic acid blood test measures the total valproate blood level. Why is a valproic acid level test important? This valproic acid test helps check if the valproate blood level is in a therapeutic range. This Valproic Acid Test is a blood test. The total valproic acid test, sometimes known as the sodium valproate test and VPA blood test, measures the total valproic acid blood level. Valproic acid (VPA) is a medication that is commonly prescribed for neurological and psychiatric conditions. Also known by the brand names Depakote® and Depakene®, valproic acid is used preventatively to reduce the incidence of seizures (e.g. tonic-clonic, myoclonic and partial) and migraines in many people. Valproic acid is also used in treating some mood disorders and manic-depressive affective disorders. It is not exactly clear how VPA functions in the body and it is largely metabolized in the liver. This total valproic acid level test is used to make sure that the valproate blood level is in a therapeutic range. Excessive blood levels of valproic acid can cause valproate toxicity. One reason valproic acid toxicity can occur is because the dosing of the medication is too high. Additionally, valproate toxicity, when using other medications in conjunction with valproic acid, competition for valproic acid binding sites can occur, leading to an increased concentration of valproate. In situations where valproic acid blood toxicity is a concern, the free valproic acid test should also be considered. Valproic acid toxicity can cause liver problems, nausea and vomiting. To get a valproic acid test near you, just order online and get tested at your selected Quest Diagnostics lab. Once the total valproate lab results are available, they will be downloadable. 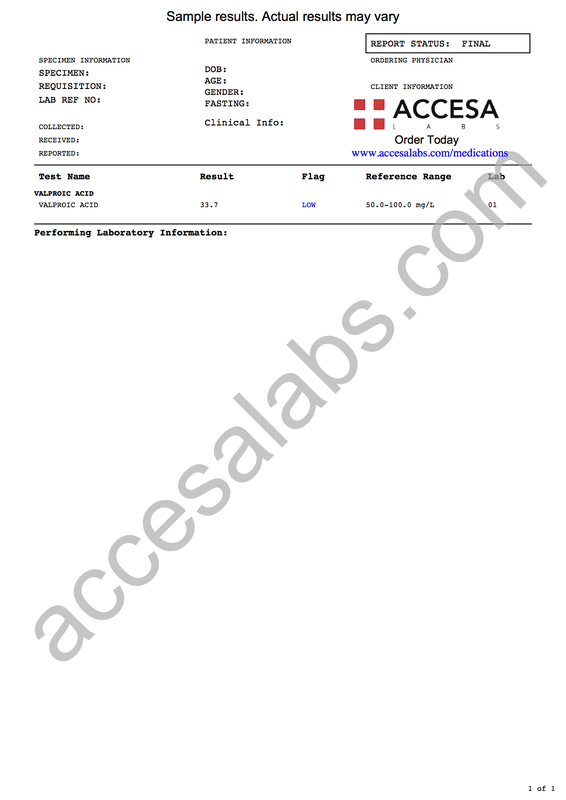 As can be seen on the sample valproic acid lab report, valproate blood levels will be reported as a number and can be compared against the reference range provided by the lab. Valproic Acid Test at Guaranteed Prices.